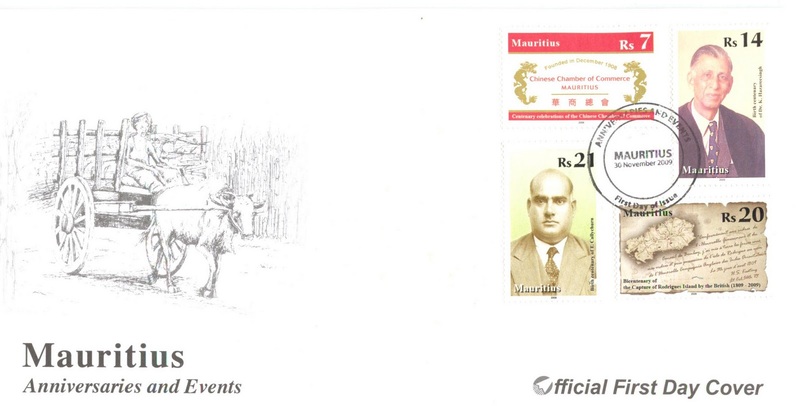 The Mauritius Post issued a set of 4 postage stamps on November 30, 2009 on the theme "Anniversaries and Events". Rs7 - Centenary Celebration of the Chinese Chamber of Commerce, founded on 8th December 1908. Rs14 - Birth Centenary of Dr. Kissoonsingh Hazareesingh (1909-1993), an accomplished intellectual. Rs20 - Bicentenary of the Capture of Rodrigues Island by the British (1809-2009). Rodrigues was officially proclaimed a British possession by Lt Colonel Henry Keating on the 5th of August 1809. 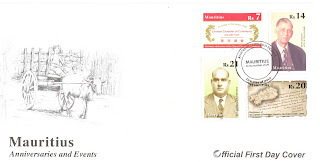 Rs21 - Birth Centenary of Teeluckpersad Callychurn, former Postmaster General. The FDC illustrates an ox-driven cart transporting sugar canes in the early 19 century. Paul Edmond Icery (1824-1883), a great Mauritian scientist is universally recognised for having devised the process of converting raw sugar with the addition of mono sulfate of lime.